Inflight entertainment can make or break my impression of an airline, especially if I’m traveling on a long international flight. Having flown back and forth overseas on various airlines, I have really come to appreciate airlines that put an effort to accommodate their passenger’s entertainment–and sanity. I usually travel alone and there’s only so much you can say to the person sitting next to you, so really it’s just you and back of the seat in front of you for the next 10 or more hours. When I boarded a flight on Virgin Atlantic for the first time leaving from LAX and heading to Heathrow, I was relieved to discover their impressive movie list and spent the entire flight watching a good selection of newly released movies and music choices. Every month Virgin Atlantic has a new rotation of recently released films and are available to watch for all passengers regardless of their seating section. With over 50 movies available from different genres that range from rated PG to R, everyone is entertained. A sample of Mays film list: Pitch Perfect, The Wizard of Oz, SkyFall, Argo and more. If you wish to stimulate your mind during your flight, Virgin Atlantic also offer games like Bejeweled, Sudoku, Solitaire, Trivia Challenge and more. With Emirates, you no longer have to wait for your flight to land to make a phone call, send a text or an email if you are on specially selected carriers. Emirates offers communication services on their flights that allow passengers to stay in contact with those grounded with satellite phones and cell phones using an on-screen service. You can even buzz a passenger sitting somewhere else on the flight with their seat-to-seat calling. If you’ve ever wanted to know what was going on right outside of your airline carrier, then that’s another reason to fly with Emirates. Emirates has cameras mounted on the exterior of the planes so passengers can view as they please. You will be pleased to find out that this not the most entertaining option, but it is definitely a unique one. 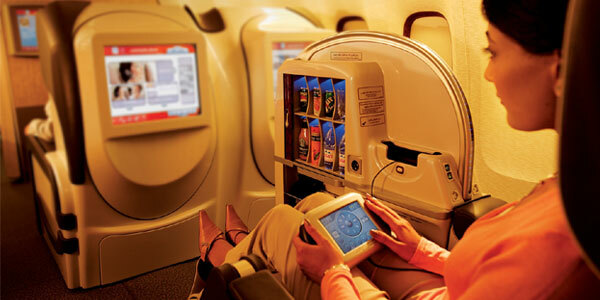 Apart from that, Emirates flights provide over a 100 hours of music for your listening pleasure, 100 inflight movies, and games to play. If you want to know the specifics of what your flight offers, you can use the tool at the bottom of this page to find out. 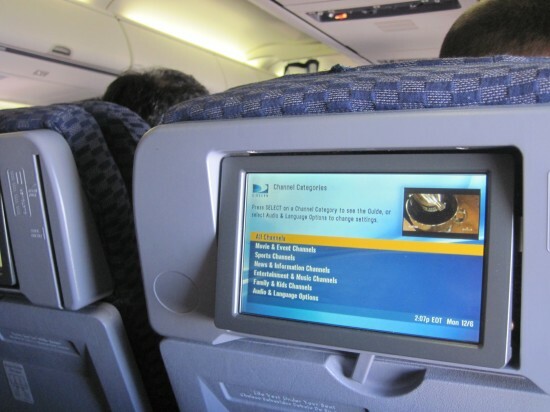 On JetBlue, expect to have to have access to DirectTV programing on all flights with a personal screen. Movies featured on JetBlue flights are first-run and if you want to purchase a premium movie to watch, that option is also available. XM Satellite radio is also available on all of their flights and all seating sections. If you wanted to broaden your horizons in addition to the physical sense of flying across the world, then Singapore Airlines inflight entertainment could be the airline to do just that. Aside from the fact that some flights offer private luxury suites that include fancy armchairs and stand alone beds, it also offers a complete entertainment library through their KrisWorld Viewer which offers over a thousand viewing options. It even offers Berlitz, a language learning program that also allows you to brush up on different cultures and customs before you land. Singapore Airlines also offers an active noise cancelling headphone set so that if you wish, the only entertainment your ears are exposed to are the ones that you choose. 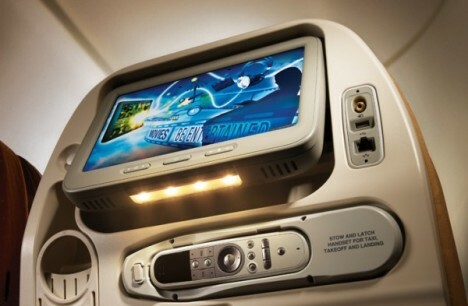 If you have all of your favorite shows and movies saved onto your iPods or iPads, then you can enjoy watching them on 15 inch screens on United flights in Business class. With this setup you can watch anything from your media library rather than being stuck with whatever the airline has chosen to premiere as inflight entertainment. 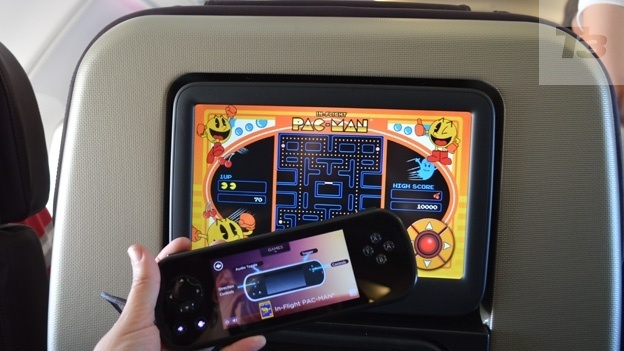 Let us know what your ideal inflight entertainment experience is for traveling well!